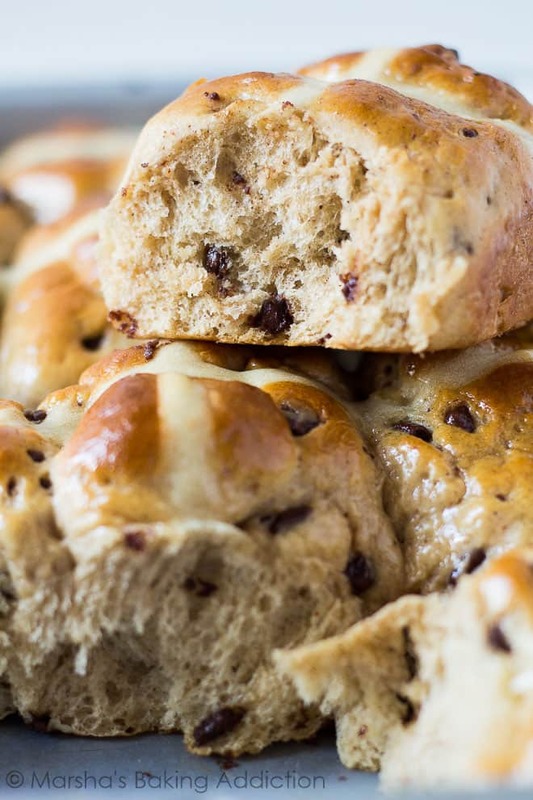 Chocolate and Orange Hot Cross Buns – Deliciously soft, and fluffy, warm from the oven, hot cross buns. Spiced, infused with orange, and stuffed full of chocolate chips! 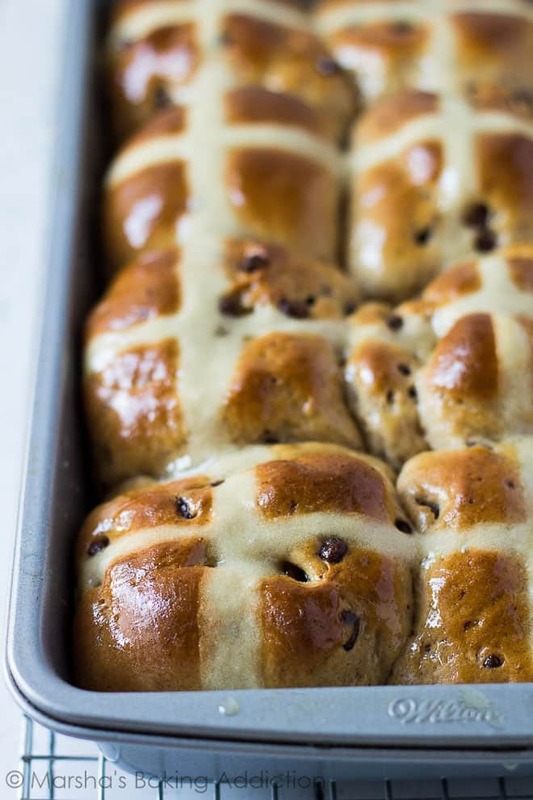 These chocolate and orange hot cross buns are so soft and fluffy, and deliciously warm from the oven, ready for a spread of butter. I’ve added some of my favourite flavours to make these buns extra special. Spiced with mixed spice (pumpkin pie spice is a great alternative here), cinnamon, and nutmeg, infused with orange juice and orange zest, and stuffed full of melting chocolate chips. All them flavours combined in a warm bun… drools! Did I mention the deliciously warm, sticky orange glaze on top? 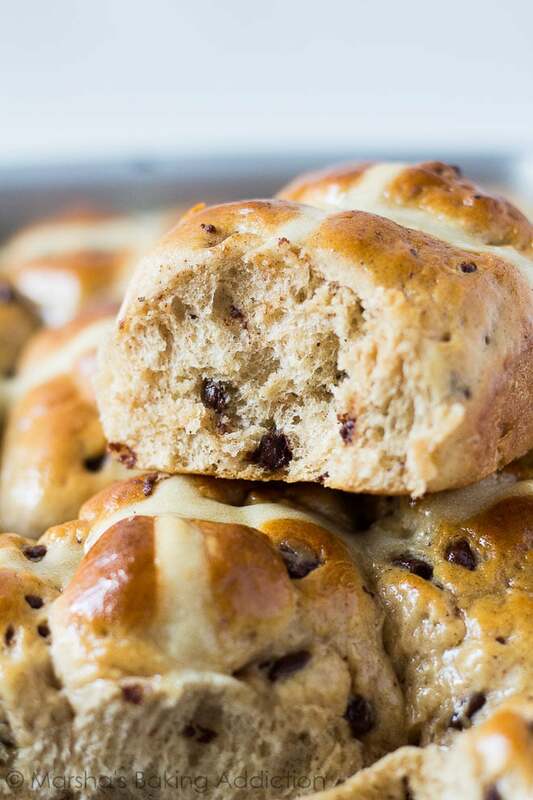 To make these hot cross buns, whisk together the flour, yeast, sugar, and spices. Toss in the chocolate chips. Make a well in the centre, and add in the milk, butter, egg, orange juice, and zest. Mix well, then bring everything together with your hands to form a sticky dough. Transfer the dough to a lightly floured surface, and knead for about 5 minutes until smooth and elastic. Place the dough into a lightly greased bowl. Cover with clingfilm and leave to rise in a warm place for 1 hour, or until doubled in size. Divide the dough into 12 balls. 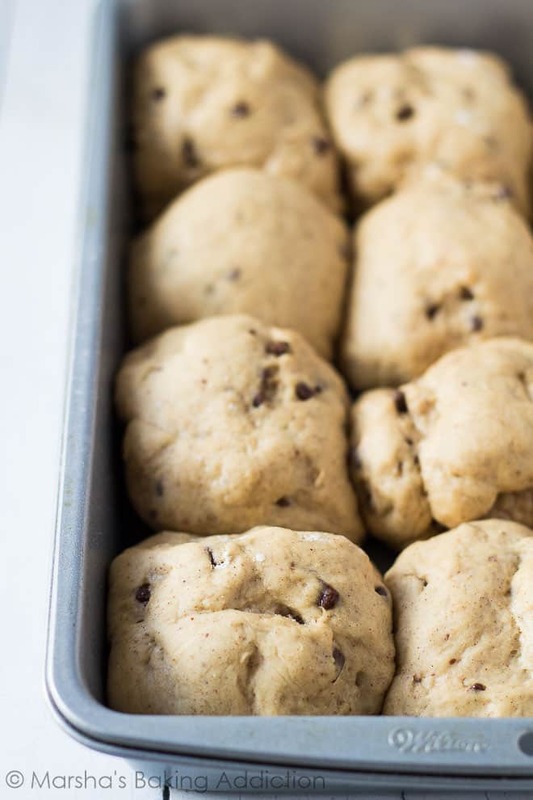 Place them in a greased 9×13-inch baking tray, cover and leave to rise in a warm place for another hour, or until they are touching and doubled in size. For the crosses, whisk together the flour and sugar. Stir in the water until smooth. Place into a piping bag, and pipe crosses over the buns. Bake for 18 – 20 minutes, or until risen and golden brown. For the glaze, gently heat the sugar and orange juice in the microwave until the sugar has dissolved. Brush the glaze over the hot buns, and serve warm. 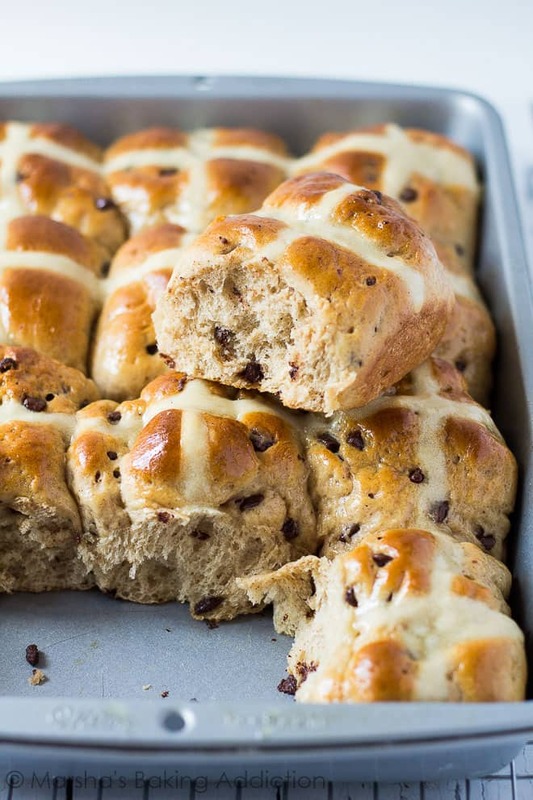 How long will these hot cross buns last? These buns can be stored, covered tightly, at room temperature or in the fridge for up to 1 week. Can I freeze these buns? Yes! These buns freeze well for up to 3 months. Thaw overnight in the fridge, then warm up or toast before serving. Try these bread recipes next! 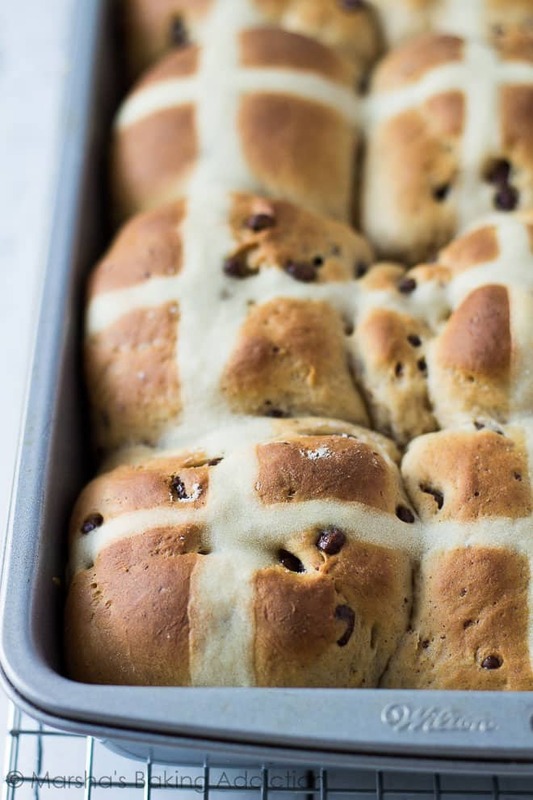 Deliciously soft, and fluffy, warm from the oven, hot cross buns. Spiced, infused with orange, and stuffed full of chocolate chips! In a large bowl, whisk together the flour, yeast, sugar, and spices. Toss in the chocolate chips. Transfer the dough to a lightly floured surface, and knead for about 5 minutes until smooth and elastic. Place the dough into a lightly greased bowl. Cover with clingfilm and leave to rise in a warm place for 1 hour, or until doubled in size. Divide the dough into 12 balls. Place them in a greased 9x13-inch baking tray, cover and leave to rise in a warm place for another hour, or until they are touching and doubled in size. Whisk together the flour and sugar. Stir in the water until smooth. Place into a piping bag, and pipe crosses over the buns. Bake for 18 - 20 minutes, or until risen and golden brown. Gently warm the sugar and orange juice until the sugar has dissolved. Brush the glaze over the hot buns, and serve warm. Baked buns also freeze well for up to 3 months. Thaw overnight in the fridge. Warm up or toast before serving. These look so pillowy soft! I’ll take two with a mimosa, please! 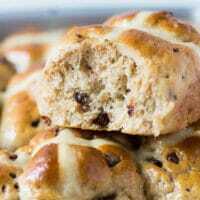 I heard that cross buns are so popular in UK during Easter. Is it true? I see a lot of them lately in the stores here in Canada. I never tried them but I am definitely looking forward to bake them. They look yum! 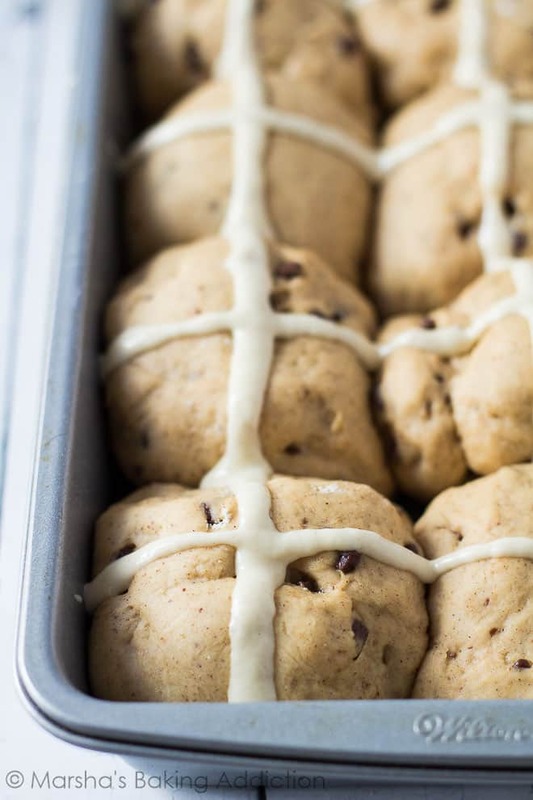 These hot cross buns look beautiful. A perfect recipe to try for the Easter holiday. I love the touch of chocolate and orange too. Have a beautiful and blessed holiday weekend. These are my kind of hot cross buns. I hate the one’s with raisins and mixed peel, so don’t normally indulge. Chocolate & orange is a whole different story altogether. I will have to give them a go. Mmmm these look so deliciously scrummy! I love the chocolate orange flavour combo! Love hot cross buns. Have never tried them with chocolate and orange though. Sounds lovely! I wanted to try this kind of cross buns for Easter, but I wasn’t feeling so well, so I did not actually cook or bake anything at all. Your version sounds even better than the one I wanted to make. It is pinned! interesting and flavorful combo. They look so soft, beautiful and delicious! Yummy! How perfect are these for Easter? Look so good, Marsha! I actually like raisins, but I’m saying these buns are still for me! They look super soft and absolutely perfect, Marsha! LOVE the chocolate and orange combination here! Unique and delicious! Cheers, girlie! 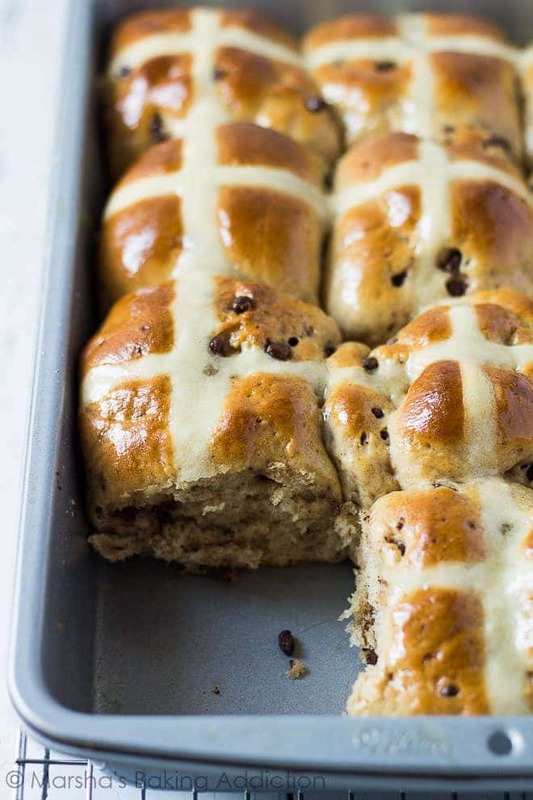 I’ve never tried making my own hot cross buns before, but these look amazingly delicious! I love your addition of orange and chocolate too! How creative! Hope you had a happy Easter, Marsha! These buns look airy soft, Marsha. Chocolate orange combination sounds awesome! That orange glaze looks beautiful. Is it horrible that I’ve never actually had hot cross buns?! Need to try your version ASAP, because they look SO fluffy and delicious! I want to dive right into these. They look so tender! Chocolate and orange is such a tempting and delicious combination. What a great ideas for these buns! I’m in the US, what is mixed spice? Can you explain what is in mixed spice in the UK? I don’t like the idea of pumpkin spice with chocolate, and want to use some other spice. Can the dough be made and rise in the fridge overnight? Would love to have this ready for breakfast in the morning without having to wake up early for the first rise. These sound delicious! Going to give them a try today. However I’m not sure why you need to sprinkle the yeast over the milk and sugar if your using instant yeast. Should just be able to add it to everything.